History : 02/10/98 : Given a system for free. 04/28/01 : Received 3 more systems for free. 08/05/01 : Given 3 more systems. 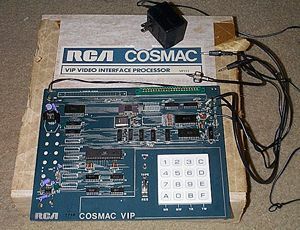 Wow, this is my first SBC and the first time I've played with an RCA 1802. Thanks Kelly! It seems to have a video connector and what appear to be cassette connectors. Need some info on how to work these. If you have anything for or about these, let me know.